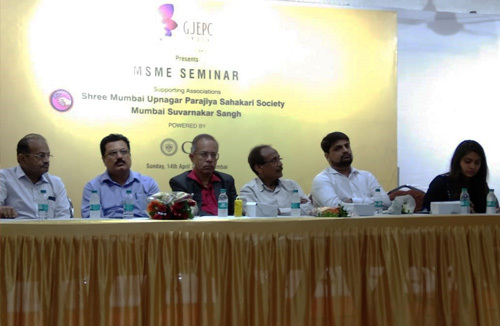 The Gem & Jewellery Export Promotion Council (GJEPC) hosted a seminar on April 14, 2019 at the Soni Samaj Hall in Borivali, Mumbai to create awareness among local jewellers from the MSME sector. The seminar was held in association with the Mumbai Suvarakar Sangh and the Mumbai Upnagar Parajiya Sahakari Society. The speakers covered different themes including information about the various government schemes for promotion of the MSME sector, a detailed presentation on procedures and advantages of getting into exports of jewellery, formalities regarding setting up and registering a company, etc. Council officials also spoke about the advantages of becoming members of the GJEPC as well as some of the promotional schemes on offer such as the Parichay ID Card, the Swasthya Ratna scheme for health insurance, etc. A large number of jewellers from both organisations were present on the occasion.